Image caption The World Health Organization says the latest figures paint "an alarming picture"
The UN body said provisional data indicated a "a clear trend", with all regions of the world seeing outbreaks. 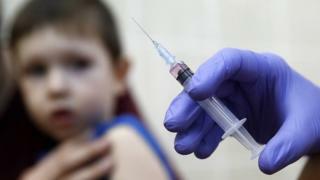 Outbreaks have also hit Brazil, Pakistan and Yemen, "causing many deaths - mostly among young children", while a spike in case numbers was reported for countries including the US and Thailand with high levels of vaccination coverage. In an opinion piece for CNN, WHO head Tedros Adhanom Ghebreyesus and UNICEF head Henrietta Fore said the world was "in the middle of a measles crisis" and that "the proliferation of confusing and contradictory information" about vaccines was partly to blame. Why the sudden 'global measles crisis'? There are two stories here - one of poverty and one of misinformation. In poorer countries fewer people are vaccinated and a larger portion of the population is left vulnerable to the virus. The pair wrote that it was "understandable, in such a climate, how loving parents can feel lost" but that "ultimately, there is no 'debate' to be had about the profound benefits of vaccines". They added: "More than 20 million lives have been saved through measles vaccination since the year 2000 alone."